University Farm Student Worker: The Truman State University Farm is a 400-acre farm located about a mile away from campus with two greenhouses, an orchard, vineyards, several garden plots, grazing land for cattle, and a number of large fields dedicated to raising vegetable crops. The duties/responsibilities of the University Farm Student Worker will vary depending upon the season and the amount of hours the student works, but may include some of the following: repairing fences; weed-eating/mowing lawns; planting, maintaining, and harvesting crops; repairing greenhouses; feeding horses, cattle, and chickens; cleaning animal pins; maintaining compost piles; pruning fruit trees; and herding cattle. The University Farm employs scholarship and work-study workers during the Fall, Spring, and Summer; and may hire Institutional Workers depending upon the season. To get more information on student positions available on the University Farm, please contact Farm Manager Bill Kuntz at brkuntz@truman.edu. To view open positions on the University Farm, see TruPositions. The Compost Project: The Truman State University Compost Project is a campus organization dedicated to reducing food waste in Northeast Missouri through the collection, management, and transportation of community food scraps. The Compost Project collects food scraps from a number of different community and camps dining areas including Sodexo, the Kirksville R-III School’s Early Childhood Learning Center, and Take Root Cafe; and then deposits them in community compost piles at the University Farm. After the decomposition process is complete, the compost is then re-allocated to community gardens as organic soil, thereby diverting waste from landfills and achieving a closed-loop system where very little energy and nutrients are lost. Scholarship Position: Students will be involved in one or more of the following areas: collecting unused food from University Dining Halls, transporting food to the University Farm, and constructing new compost piles at the University Farm. The Compost Project currently offers work-study and scholarship positions for eligible students, as well as a year-long internship for 4 hours of college credit. For a list of open positions, please visit TruPositions. For more information, contact Dr. Ben Wodika at bwodika@truman.edu, Thomas Felman at tjf1112@truman.edu, or view the project’s website. Internship: The Compost Project student intern oversees all daily operations of the Compost Project which includes scheduling work-study/scholarship workers for collection and pick-up shifts, transporting compost from campus to the University Farm, training new employees, coordinating with Sodexo management and staff, meeting with community organizations, assisting in compost pile building at the University Farm, and completing a personal internship project to continue to build capacity and community support for the Compost Project. The year-long internship is available for 4 hours per semester of credit. For more information, please view the project’s website. 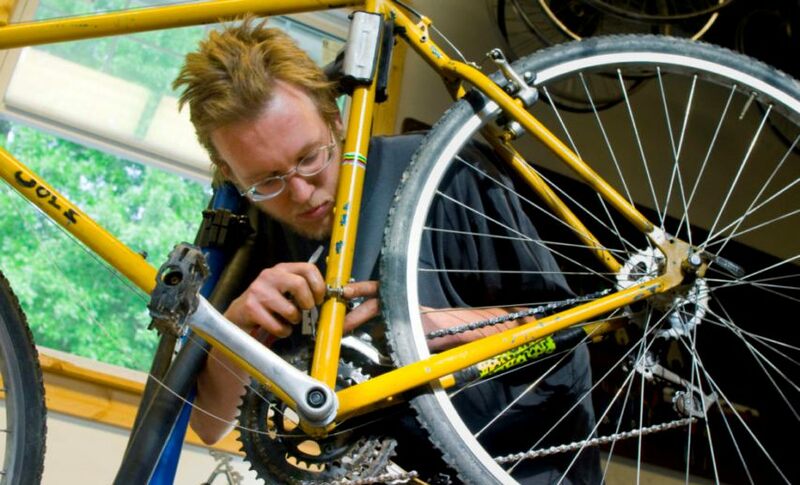 Bike Coop Mechanic: The purpose of the Kirksville Bike Coop is to provide an affordable and accessible educational training space for bike repair to campus and community members in order to increase the volume of cyclists in the Kirksville area. The Coop offers not only to adjust, fix, and tune bikes for community members, but also seeks to instruct individuals on how to maintain the bicycle themselves. As a Bike Coop Mechanic, you will be tasked with one or more of the following areas: selling bicycle parts, handing bicycle sales and rentals, repairing bicycles, instructing individuals how fix bicycles, handling financial accounts, keeping records, and planning bicycle-related events. You are not required to have any prior experience in bicycle repair or maintenance to be eligible for these positions, only a general aptitude for mechanical skills. The Coop currently offers work-study and scholarship positions, and will also take any volunteers that have an enthusiasm for cycling. For a list of available positions, please visit TruPositions. For more information on the Coop, contact Dr. Ben Wodika at bwodika@truman.edu or visit the Coop’s website. Green Thumb Project Student Worker: The Green Thumb Project is a local Missouri non-profit dedicated to facilitating access to and providing education on sources of healthy, nutritious food through the maintenance and construction of community gardens in Kirksville. The Green Thumb Project is involved in 4 main areas in Kirksville, including the Ray Miller Elementary School, the Early Childhood Learning Center, and the Kirksville Housing Authority locations of Village 76 and Devlin Place. Students can get involved in a number of different areas within the Green Thumb Project, including community garden maintenance, compost collection and transportation, outdoor education lessons, nutrition lessons, social media/website design, event planning, and construction projects. The Project currently offers scholarship and work-study positions, as well as summer internships and will gladly take any volunteers that have a passion for local foods. For a list of available positions see TruPositions or email the current AmeriCorps member at gtgarden.raymiller@gmail.com. For more information or a list of upcoming events, visit the Green Thumb Project’s Facebook page or website. Sustainability Office Student Worker: The Truman State University Sustainability Office seeks to provide information on environmental sustainability movements on campus as well as connect students to sustainability-related organizations in order to help them get involved. As a Sustainability Office Student Worker, students will be tasked with networking and coordinating with sustainability organizations on campus, managing the sustainability office email account, planning events in partnership with community and campus organizations, meeting weekly with the Sustainability Office Intern, and designing flyers and brochures on campus environmental issues. The Sustainability Office offers scholarship and work-study positions for eligible students, as well as an internship for credit or institutional hours. For more information on positions available through the Sustainability Office, contact Chair of the President’s Sustainability Action Committee Donna Liss at dliss@truman.edu. Student Teacher: At Truman, students are able to design and teach their own course under the supervision of a faculty adviser for scholarship hours, work-study hours, or credit. Many students in the past have taught courses in sustainability related fields, including ENVS 331 Expanding Environmental Consciousness, ENVS 332 Grassroots Environmentalism, IDSM 320 Ethics of Food, and IDSM 351 Interdisciplinary Global Health Seminar. If you are interested in student-precepting a course that is currently being offered, most faculty advisers require that you first enroll in the course as a student, receive a “B” or an “A” as a letter grade, and then sign-up to teach the course as a student-preceptor. If you are interested in student-precepting a course that is no longer being offered or you are interested in designing a course from scratch, you must first meet with a faculty adviser who is willing to sponsor the course, and then attain approval from the Truman Administrative Offices. Sustainability Office Internship: The Sustainability Office functions as a resource to students by providing information on different sustainability efforts on campus. The office also seeks to coordinate and connect different sustainability-related organizations on campus to create a more unified approach to improving environmental sustainability at Truman. As the Sustainability Office Intern, the student will manage 3 scholarship workers in the office, organize events with on-campus sustainability organizations, hold weekly meetings with community partners, draft flyers for events and environmental updates on campus, and coordinate with University faculty and staff on how to improve sustainability efforts on campus. Students have the option of doing the internship for credit or paid institutional hours. If you are interested in serving as the intern for the sustainability office or would like more information on the position, please contact the Chair of the President’s Sustainability Action Committee Donna Liss at dliss@truman.edu. Digital History in Sustainability Internship: Digital History in Sustainability Internship was created to document the strides in sustainability made at Truman State University through the maintenance and upkeep of the sustainability website. The website also serves to provide a comprehensive resource for incoming students, current students, faculty, and staff on sustainability efforts on campus. As the Digital History in Sustainability Intern, the student will update and design the Truman State University sustainability website, compile information on sustainability endeavors on campus through interviews and research, and manage the Digital History in Sustainability email account. Students have the option of doing the internship for credit or for institutional hours. The internship is advertised through TruPositions and is usually offered in the Spring, but dates may vary depending upon the year. For more information on the internship, please contact Chair of the President’s Sustainability Action Committee Donna Liss at dliss@truman.edu.